Think of an industry that for the last three decades has been dominated by three or four major suppliers, and offers a full range of products and services that have served the majority of their customers very well. In the last decade that industry has suddenly seen new emergent competition from bold, start up ventures that offer a smaller range of products and services, distribute themselves in a slightly different way and are increasingly gathering market share. These bold new entrants have resulted in the established suppliers changing their business models, adjusting strategies and rationalizing their businesses. And that industry is…the UK retail sector. But it could be the UK airline industry just as easily. The parallels are pretty revealing. With Tesco announcing 2,000 job losses this week, the current shake-down in the UK supermarket sector bears striking similarities to what aviation has gone through over the past 30 years. Low Cost Carriers (LCCs) have now secured around 36% of scheduled capacity within Europe and since 2010 some 94 million seats per annum have been added by LCCs in Europe alone; legacy carriers added some 19 million. Low cost supermarkets such as Aldi have seen their market share grow by over 30% in the last year; it’s still only 4% of the market but so was Ryanair’s at one time! Just like LCCs, the budget supermarket suppliers limit their range of products, simplify the price, make the offering very transparent and pile it high. That’s precisely the same business model as LCCs, whose average capacity per flight in Europe is some 14% higher than their legacy counterparts whilst average aircraft utilization from LCCs frequently offers up to a 15% efficiency benefit. In times of hardship, tighter disposable income, restrictions on corporate travel policies and a pressing need for value for money, consumers turn to alternate choices and adjust their purchasing patterns. We’ve experienced this in the airline sector in the last decade, so are we now seeing that in the high street supermarket sector? High value service providers such as Emirates, Etihad and Qatar Airways challenge the established brand values and perceptions at one end of the market. At the other end, Wizzair and Ryanair have certainly tested the brand values of many mid-market carriers in Europe. Are Waitrose the equivalent of Emirates & Etihad and Aldi and Lidl the Ryanair and Wizzair business models? 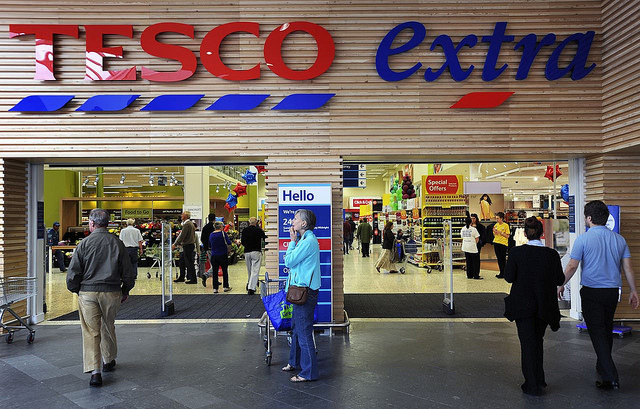 Tesco, like many of the major traditional airlines, will likely have a long painful journey. The likes of British Airways, Lufthansa and Air France/KLM are still here but have had to make major changes in the way they operate; even in the past month Air France is still grappling with unions over how to reduce headcount and costs. Sometimes looking at parallel industries, market trends and changing consumer purchasing patterns can reveal as much about our own industry as it does others. Perhaps aviation has once again pioneered the new world order!